The apartment we offer is located in the central area of ​​the city, close to Lidl and the District Hospital Center. 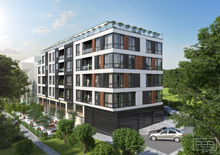 The apartment is located in a luxury building featuring high quality construction. 2nd floor: entrance hall with fitted wardrobes, 2 bedrooms, bathroom, terrace. The building has luxurious common parts made of natural granite, high ceilings, equipped with video intercom system, gas installation and air conditioning, massive entrance doors, PVC joinery with low emission glass packets, elevator servicing all floors including the basement. The apartment has a spacious parking space included in the price. The area of ​​the district hospital in Varna is a very convenient place to live. Nearby there are numerous kindergartens, schools, supermarkets, shops, medical centers, banks, etc. The city center is only about 10 to 15 minutes walk away.